This is a review of Inhairit Hair Growth Vitamins. The makers of this product claim it maintains healthy and beautiful hair. The vitamins are one part of a hair growth system including a shampoo and conditioner as well as a topical solution. To learn more about Inhairit Hair Growth Vitamins continue reading to find out if this is the product for you. No one ingredient is listed on the website as a main or active ingredient. The ingredients combine to stop hair loss, stimulate new growth, and rejuvenate dead follicles. The makers recommend taking one tablet three times each day. If you are taking any supplement you may wish to take with food to avoid stomach upset. The website claims there are no side effects from taking this product. After research, no negative comments were found about any adverse side effects. If you are allergic to any of the ingredients you should not take this product. Allergic reactions range from vomiting, or dizziness, to trouble breathing, if you experience any of these when taking Inhairit Hair Growth Vitamins you should discontinue use immediately and see your physician. This product is sold for $37.95 plus shipping and handling charges for a one month’s supply. It can be purchased with more merchandise or more bottles of vitamins at a discounted price. 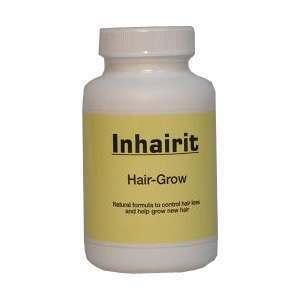 Inhairit gives no guarantees their Hair Growth Vitamins will work. No refund will be issued on opened bottles, you can return unopened bottles in their original packaging for a refund, less shipping and handling charges, if you are not satisfied with the results. Inhairit Hair Growth Vitamins are one part of a system consisting of a shampoo, conditioner, and a topical solution. One should not assume taking the vitamins alone will give them satisfactory results, as this is designed to work as a system. Consumer feedback on the website was overall positive in nature and many recommended using this system. It should be noted you can purchase the entire system for $105.95 plus shipping and handling for a month’s supply. This system was found to be useful to both men and women, though pregnant women or women who are breast feeding should talk to their physician before taking this product, as should anyone on medication. The consumer can return any unused products for a refund, though it has no guarantee. No information was given if this product was vegetarian friendly or not. If that is something which concerns you there is a place on the website where you can ask questions to help you find the information you need to make a decision before you make a purchase. There was no information found about where this product is manufactured. John Brownstone	reviewed Inhairit	on August 3rd	 and gave it a rating of 2.5.